“Tell me about yourself!” These are the 4 dreaded words that set fear in the hearts of many interviewees. If “49% of employers know if a candidate is a good fit in the first 5 minutes of an interview,” at least 2 of those crucial minutes are taken up asking and answering this question so you’d better be prepared (CareerBuilder). Below, I’ve compiled my best tips for answering this question and the methodology of how to get it done. Hopefully this will make things a little easier next time you’re in the ‘hot seat’. You want this statement to be short and sweet. If you are rambling on longer than 5 minutes about what your passions are in life, where you went to middle school, or why you left your last several employers, you have most likely lost the interviewer’s attention potentially for the remainder of the interview. On the reverse side, if you speak too little, it may look like you are unprepared and ill-equipped for the job. This is almost always the first question asked, so come prepared with a strong answer or you might as well start sending your resume out again. "Tell me about yourself" is a trick question. What they really mean is, "How can you solve our problem?" Every employer has a problem that needs fixing, an area they need filled, or a skill their team is lacking. If you identify what that "need" is and incorporate it into your opening statement, the interview gods will smile down on you. Read the job description or just ask the recruiter why the position is open and why they are prospecting. Your goal is to establish yourself as the solution in this opener. Make this list specific. Think of specific achievements in your career and remember that figures (percentages, numbers, and dollar amounts) can always help quantify what you’ve accomplished. From your list, select several accomplishments to use in your opening statement based on what they are looking for. Don't worry the rest of your list won’t go to waste. These extra bullets are now examples you can fire off in the interview. 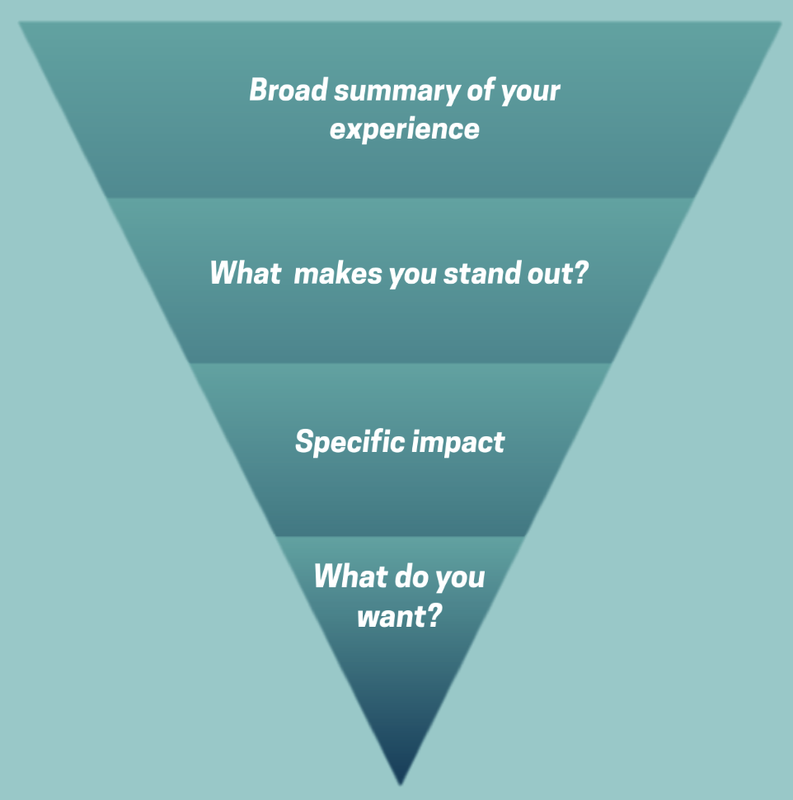 Following the Funnel Method will help you organize your thoughts, stay concise, and address the needs of your potential employer. To begin, talk about your career from a general overview; then, describe the 2-3 specific achievements relevant to their needs you selected and explain why they were impactful. Lastly, make sure you say what you are there for and why you are a fit for the position. Broad Summary: I have over 10 years of experience in the entertainment industry working for a variety of media outlets and agencies. What makes you stand-out: Most recently, I had to collaborate closely with executive management while I led a marketing team through a new campaign launch for our largest client, XYZ. Specific impact: This project resulted in over $10M in revenue and over 100K new followers. I also directly oversee the departmental budget, financial forecasting, and professional development of my direct reports. Say what you want: I’m currently looking for my next opportunity with an innovative company with a forward focus. After speaking with friends who referred me here and after doing my research about this role, I believe the skills I bring to the table make this a mutual fit. Framing your statement in this way will help you organize the structure of your “tell me about yourself” responses more effectively. Most importantly, continue to practice, improve, and build on your answer. You literally have the first question to the test, so study your answer. Hopefully this will help make sure you get the interview started off on the right foot. Want more tips on interview questions? Read our 3 part series on job interview tips. How do you answer "Tell me about yourself"? Comment below! Newer PostJob Search Strategies: Are you using All the tools?